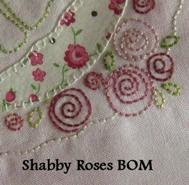 Super cute and FREE Shabby Roses embroidery BOM project over at Jenny of ELEFANTZ…first three blocks are posted now (May ’09), and she’ll take them down as she adds new ones. Check it out. Thanks, Jenny!